Kim Kardashian Talks Love, Divorce and Kanye West! 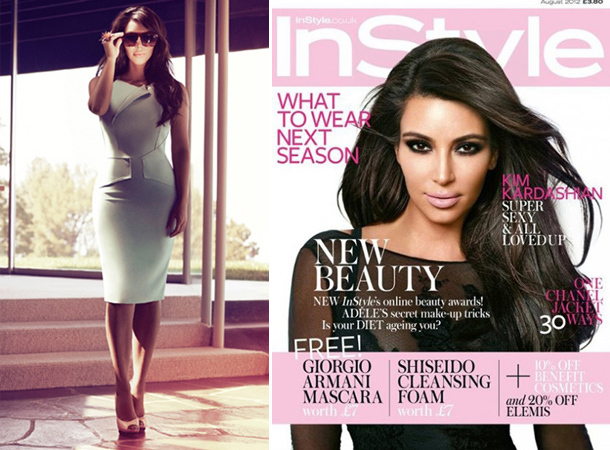 Kim Kardashian graces the cover of InStyle UK for the August issue! The 31-year-old speaks candidly with the mag, opening up about love, her recent divorce and her romantic relationship with Kanye West. In the August issue, Kim confesses that she’s a hopeless romantic … telling the mag that although she’s been in love many times, she’s never been lucky when it comes to long-lasting relationships. "I’ve always been the type to fall in love fast and, with every boyfriend, I plan out my wedding in my head. It’s taught me to take things slow." Kim finally had her fairytale wedding when she tied the knot with NBA star, Kris Humphries, but she’s yet to have the fairytale ending. The reality star, who called it quits with Humphries 72 days after saying “I do,” tells the mag that she needed to just keep her head high post split. “Anyone would want to move on and take the lesson learnt from it. I loved this person, it just wasn’t the right situation for me. I try to hold my head up high and live my life." But it doesn’t seem like Kim is taking her new relationship with Kanye West slow by any means … the two have been almost inseparable as they continue to jet set around the world together! We’re definitely excited to see what’s in the future for Kimye! Kim Kardashian Shows New Face in France! Kim Kardashian, Beyonce & Mariah Carey Stun at BET Awards!